Once upon a time, in 2012, I created my first online cake decorating tutorial on how to make fruit roll-up cake flowers. It set off an avalanche of ideas that I wrote all about here. For a while now I’ve been wanting to update the concept. Image by Mark Davidson Photography. 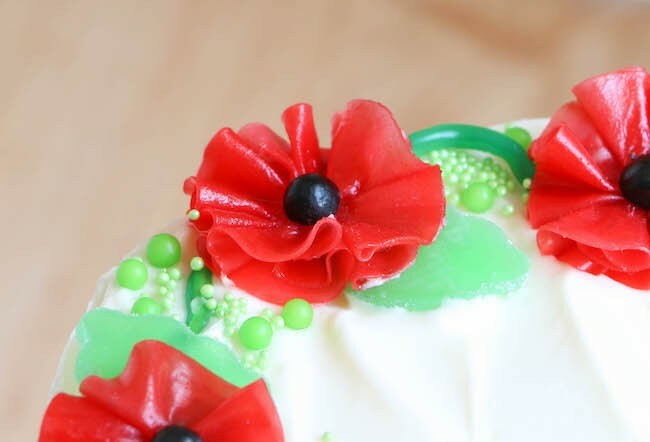 Over the summer I came up with this fruit roll-up poppy flower version of the original design, but I thought it looked too Christmas-y to post. I tucked it away and totally forgot about it, until now! Don’t you love when your past self leaves little surprises for your future self? It definitely perked up my Tuesday morning. Since I didn’t plan on sharing this in the moment, I also didn’t get process shots. I did, however, get process video! If you prefer to learn from images, click back to my original post for the basics on making a fruit roll-up puff here. Red fruit roll-ups totally skew holiday, but you can use whatever color or flavor you can get your hands on to celebrate whatever you want! 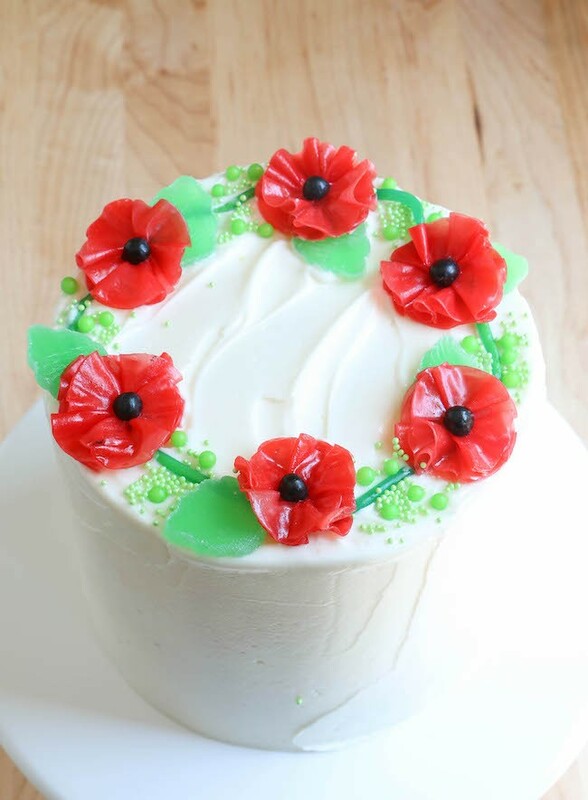 These would also be very pretty as poppies on a Remembrance Day or Veterans Day cake, or even a Valentine’s Day Cake. Unroll one of the fruit roll-ups and wipe off any “tongue tattoos” with a damp paper towel. Cut the square into circles using the back end of a large piping tip or a small circle cutter. Pick up a circle and pinch the edges together between your fingertips. Repeat with the rest of the circles. Make a circle with the ruffles, points facing the middle. One fruit roll-up should make about two flowers for you. Trim the ends off of a black jelly bean. Place one of the domed ends into the center of the flower. Cut slices from a gummy leaf to tuck under the flowers. 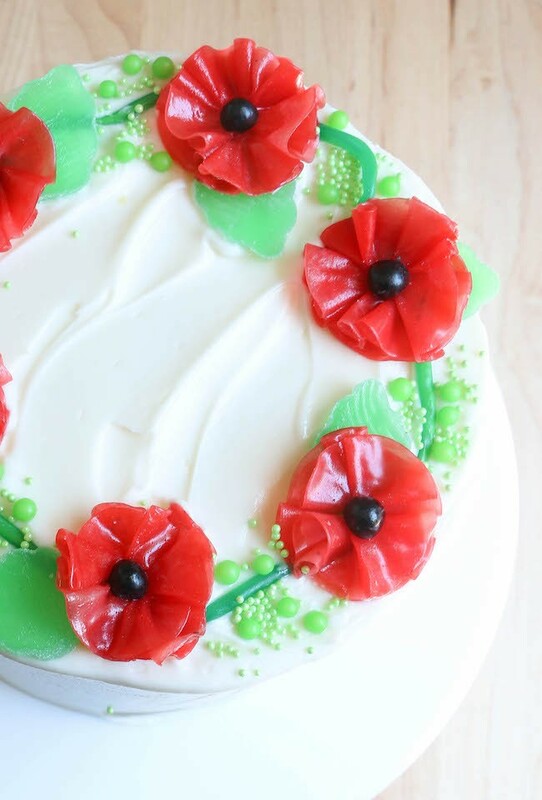 Place a piece of green licorice rope around the edges of your cake or anywhere you’d like to arrange flowers. Set the finished flowers on top of the licorice rope and tuck leaf slices in around them. 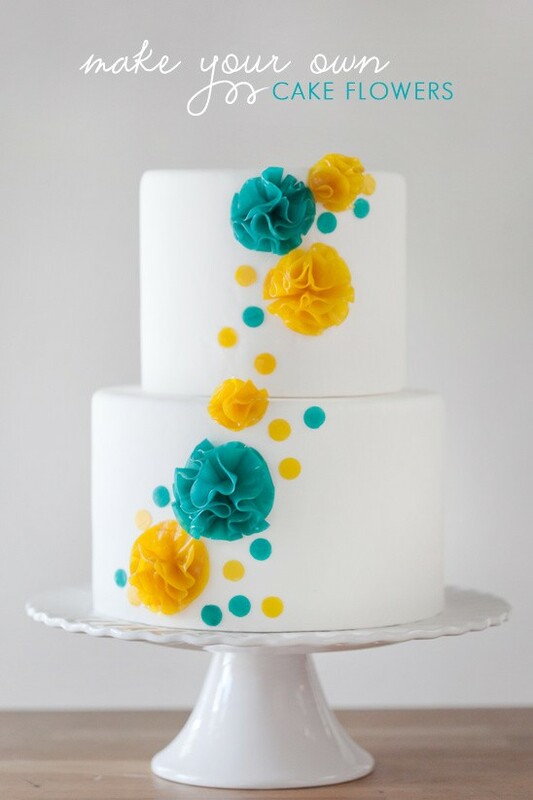 Fill in spaces between flowers with a dusting of green nonpareils and sprinkle pearls.